In January 2009, a dispute between Russia and Ukraine led to the closure of a major natural gas (Onwards Gas) pipeline and the worst gas cut-off of the decade. Gas supplies to eighteen countries were disrupted and countries with limited reserves and a lack of alternative supply faced severe energy shortages, resulting in thousands being without heating amidst an especially cold winter. Central Europe suffered most. In Bulgaria many households had to rely on an overloaded power grid to keep heaters running, while Slovakia and Croatia declared a state of emergency, with much of industrial production coming to a halt. Poland and Hungary similarly limited industrial use of gas. Finally, after 22 days, gas flows to all European countries returned to usual levels. As a result of this, and a similar dispute in 2006, the EU and its member states have questioned the reliability of Russian gas supplies. The uncertainty has led to renewed political interest in energy security on EU and member state level. In my opinion the Russian cut-offs have served as a timely wake-up call to policy makers at a time when the EU faces further equally important energy security challenges as a result of the emerging world order. The EU buys more than half of its energy from non-EU sources, while demand for energy is growing in the EU and globally. Indeed the International Energy Agency (IEA, 2012:52) has predicted world demand for energy to increase by 35% between 2007 and 2035. At the same time, EU production levels of hydrocarbons are reducing, leading to increased dependency on non-EU sources. As such Energy Security has become a globally important topic and will pose considerable challenges for the EU and its member states in the future. This paper aims to show that the EU needs a more comprehensive external energy policy which includes not only market-based but also geopolitical elements. To highlight the need for such an approach I will examine the current EU external energy policy, the patterns of energy policy and its implications, discuss EU-Russian dependency, and finally, highlight the possible solution of LNG. This paper questions (a) to what extent the EU presents a coherent policy towards energy security? (b) What kind of gas security pattern can be identified within the EU’s gas environment? And (c) Why has Russia been successful in undermining the EU’s energy policy? My first hypothesis is that the overarching EU policy of market governance is weak, limited, insufficiently funded and fragmented. Chapter 4 will analyse the EU’s model for external energy security, namely market-governance and its components, examine the European Community for Energy and the EU’s relationship with North Africa and Russia. To answer the second question, I will prove that distinct security patterns emerge in Europe between those states that have high to medium short-term security of supply risk from Russia and those states with low to medium short-term supply risk from non-Russian sources. To identify these patterns I will draw largely on Coq and Paltseva’s (2009) model which has measured the security of supply risk through macro-economic modelling using a variety of factors, which will be discussed in detail in Chapter 3. This paper will then discuss whether the fragmentation of EU policy has led to the dominant position of Russia. To identify, whether this last hypothesis is true, we will be discussing Russian external energy policy towards Member States and showing that Russia indeed acts differently with different member states and due to the fragmentation of EU policy, Russia is able to divide the EU and pursue its Realpolitik policies. First, we need to understand the concepts of energy security, which will be discussed in the subsequent chapter and secondly in Chapter 3 we will (a) get an overview of issues facing the EU and (b) understand the factors involved in Coq and Paltseva’s (2009) model. In Chapter 4 we will be discussing the EU’s external energy policy and in Chapter 5 we will be drawing in discussed factors (Chapter 3) to highlight patterns and issues resulting from this. To achieve the above we will be using a mainly secondary research approach, which will include building on existing secondary academic work in the field of energy security, in particular on research into dependence on Russia, Coq and Paltseva’s (2009) model of measuring energy risks and the EU’s External Energy policy. Furthermore I will be drawing on primary EU legislation. Finally, this paper will also be using BP (2012) and ENI (2012) data to give an up-to-date picture, through the use of graphs, of the EU’s energy and in particular gas environment. This paper will also build on a variety of examples mainly drawing on Lithuania, Poland, Germany and Spain to support the arguments with empirical evidence. Within the discussion this paper will restrict its view of gas security to those member states that have gas within their energy mix, therefore will be disregarding Cyprus and Malta; it will not examine the effects of shale gas extractions as the future of this method is unclear and very controversial; and finally will not go into the EU’s promotion of democracy through its energy agreements. A country’s concept of energy security is dependent on their own particular energy situation based on their state of development, geographic location, their national endowments, political systems and international relations. Therefore there is no uniform concept of energy security as it means different things to different nations (Luft et al, 2011:44). This paper considers the economic view established within a market-based, while the political view can be seen as a geopolitical approach to energy security. A general definition of energy security is often cited as being composed of availability, reliability, affordability and sustainability. Availability refers to the ability of consumers and users to secure the energy they demand through the existence of a commercial market, sufficient physical resources, investment and technology. Reliability refers to the extent that energy services are protected from disruption i.e. military, natural disaster or political risks. Affordability can be seen as stable and low or equitable prices relative to income. Finally, sustainability refers to minimising social, environmental and economic damage that can result from long-lived energy infrastructure (Elkind, 2010:119-148). These factors cut across all three concepts of energy security and indeed are present throughout the discussion. This section will show the three broad views of energy security; the ecological, economic and political (Sovacool, 2011:6-11; Checchi et al.,2009). The ecological view distinguishes between energy resources: renewable or non-renewable, clean or polluting, and inexhaustible or depletable. It argues that in the long run all energy supply should be low carbon, whilst affordability and reliability are less of an issue due to mainly relying on renewable energy production. Finally sustainability is a key factor and especially reducing the environmental impact is seen as a core issue within the ecological view of energy security (Savacool, 2011:7). However the link between climate change and global and EU’s energy security has been argued to be relatively weak. When examining the past energy crises climate change has yet to cause an energy crisis (Luft et al, 2011:54). Therefore this paper will concentrate on the following views: economic and political. The economic view sees energy as a commodity which is traded on the market. Noël (2008), argues that the concept of energy security is a myth and indeed meaningless, as energy matters are subject to market rules, while political and hard-power factors are left aside. Availability and reliability are seen to be secured by market dynamics. Whilst affordability is achieved through substitutions; when prices of an energy source rise, said fuel is substituted for more economical fuels and governments only intervene when market failure occurs. Noël (2008), drawing on the 1970s energy crisis and the Venezuelan strike of 2002, argues “that free markets are the consumers’ first line of defence”. Indeed, he argues that China learned from its chronic oil shortages caused by import and price regulations and has moved towards more market control. Therefore he argues that “higher prices are not an energy security problem but a solution”. In essence the economic view sees energy security as being played out by free market economics with minimal intervention from the state. Free market economics requires liberalisation of the markets, with the aim of increasing the number of market participants, improving the flexibility of producers and increasing competition therefore increasing security of supply. Governments only have a limited role yet only through regulation and legislation can especially social and environmental sustainability be achieved. Contrary to this view a political view emerges in the literature which focuses on the increasing re-nationalisation of energy resources, the geographic location of energy resources, the stability of producing and consuming countries, the availability of fuel substitutes and the politicisation of energy management which have made energy security a concern for national security (Yergin, 2006). They argue that the challenges faced today cannot be solved through simple free market economics and therefore energy security requires international cooperation, government intervention and military control. Within this view availability and reliability are achieved through government involvement, affordability through long-term bi-lateral contracts and sustainability through government regulation and legislation. Unlike oil, gas is an energy source that is relatively difficult to store and transportation is far more rigid (Haighighi, 2006:11). Pipelines are the traditional choice for transportation. This means that a physical link between producer and consumer is required and thus alternative pipeline routes are limited or long-term capital investments are needed to establish alternate routes. For instance, Ex-USSR states have close ties with Russian gas supplies due to an existing and established pipelines network which was established during the Cold War. Oil is far more flexible and cargo destined for one country can easily be switched to an alternate destination (Haighighi, 2006:11-13). Liquefied Natural Gas (LNG) is far more similar to the oil trade and made up 20% of EU imports in 2011 (ENI, 2012). LNG is seen as favourable over pipelines as it provides increased diversity of imports (Kecse, 2010:5-6). To summarise, in the case of oil transport is cheaper and more flexible and oil is traded on global markets, while gas transported by pipeline is more rigid, largely based on established pipeline routes and therefore trade is far more regionally restricted. In terms of Energy Security, pipeline supply tends to be subject to long-term bilateral agreements, which indicates the geopolitical nature of this very much network-bound supply method. Trade in LNG is far more global. Due to the regional nature of gas, in particular in Central and Eastern Europe countries (CEEC), dependency is a core issue within the debate surrounding gas security. Although economic and physical restrictions apply to gas more than to oil, global demand for gas is projected to increase by 1.6% between 2010 and 2035 (IEA, 2012:125). This rate of growth differs between regions, with non-OECD countries experiencing three times faster growth than OECD economies. Reasons for the increased demand for gas are six-fold. Firstly, the 1970s oil shock highlighted issues with importing large quantities of oil from a small number of suppliers and governments therefore set out to diversify their energy mixes to reduce the threat of a similar energy crisis; Secondly, Western powers found and started to exploit large indigenous gas fields, which led to the construction of gas-fired power plants and economic incentives to base industry on gas (UK, Netherlands, Norway); Thirdly, total remaining resources are believed to amount to 230 years of output at current rates (IEA, 2012:125) and therefore longevity of supplies exceeds that of oil; Fourthly, Gas is the cleanest fossil fuel with considerably less CO2, sulphur and nitrogen oxide emissions and therefore has the least impact on the environment; Fifthly, gas-powered power plants are the cheapest and quickest to construct and gas can replace coal in existing coal power-plants; Finally, gas has been put forward as a medium to long-term solution due to the need of back-up energy sources in a sustainable and renewable economy as gas can respond to sharp load and demand changes on the power grid, which renewables find hard to do (Gas Naturally, 2012a; Gas Naturally, 2012b). Between 2010 and 2035 world demand for energy is estimated to increase by a third (IEA, 2012:23), Europe’s primary energy demand is projected to increase by 0.6% a year; while the EU’s indigenous hydrocarbon resources are declining (IEA, 2012). The EU is already importing more than half of its energy demand and this number is set to increase. Currently the EU27 imports 40-45% of gas, with 45% of imported gas coming from Russia (Figure 1). At the same time, the EU is facing increased competition for the supply of energy from non-OECD countries, which already account for more than 50% of global energy consumption (Faas et al, 2011:14). Generally, therefore the EU is increasingly dependent on a small number of energy producing nations and is increasingly sharing its role as a major consumer of energy with other nations. This section will explain the main characteristics of the EU’s gas market using the variables identified by Coq and Paltseva (2009) although not addressing energy fungibility. Gas consumption in the EU is expected to continue to expand in all three scenarios laid out by the IEA. Global demand had fallen by 2% in 2009 as a result of the global recession; however in 2010 it experienced 7.5% growth. EU demand is expected to only slightly increase on 2010 levels by 2020 but will experience overall growth of 0.6% by 2035 (IEA, 2012:125-131). The IEA accredits the only marginal growth until 2020 to relatively high gas prices, strong growth in renewables-based power and low carbon prices, which favours coal in power generation. 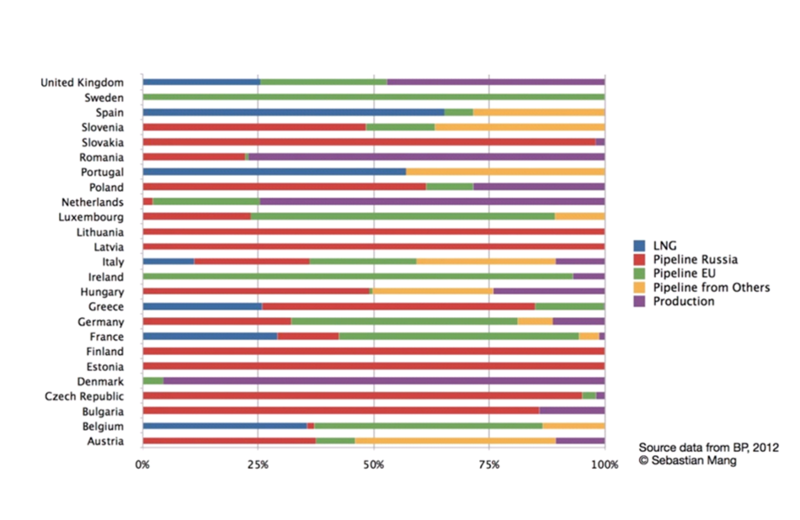 Within Europe, wide discrepancies exist in the member states’ primary energy mix. Gas makes up an average of 25% (mean of 21%) of the EU Energy mix with a standard deviation of 12% (BP, 2012), which points to clear differences in the use of the energy source in Europe. 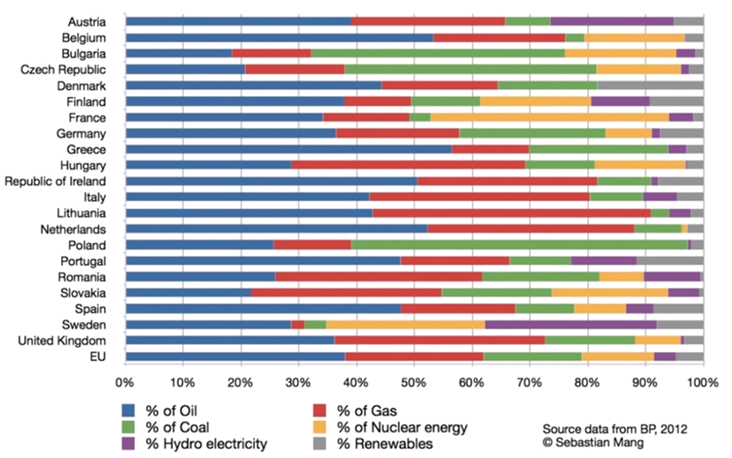 However, Lavagno (2009:13), who compares a wide range of energy sources, argues that gas represents a relatively homogenous energy source compared to oil, coal or nuclear. The differing energy mixes are the result of a variety of reasons including historic ties with producing countries (especially CEEC and Baltics), indigenous resources and decisions to abstain from or allow nuclear energy production. The EU’s proven reserves of gas (1,700 billion cubic metres (bcm) in 2011 (BP, 2012)) are extremely limited when compared with those of major producers: Russia 43,302bcm; Iran 29,610bcm; Qatar 25,465bcm; Norway 2,908bcm. Indeed, the EU’s production of indigenous gas peaked in the mid-1990s at around 270bcm per annum, plateaued until around 2005 and has declined since then. This trend is forecast to continue, with the EU’s projected output to drop from 201bcm in 2010 to 94bcm in 2035 (IEA, 2012:138). Within Europe the production of gas is centred on a small number of countries: Netherlands (1,100bcm), UK (200bcm), Poland (1020bcm), Romania (108bcm), Germany (87bcm) and Denmark (62bcm) (BP, 2012). Although the IEA (2012:138) expects indigenous supply of conventional gas to reduce in the future, shale gas has been tipped as a ‘Game Changer’ for the EU’s Gas Security (Gény, 2010) but will not be covered. Europe and its member states have increasingly tried to increase the pipeline network internally as well as externally. Internal cross-border connections remain undeveloped and limited and are a major challenge for the EU. Although the Trans-European energy networks (TEN-E) has tried to solve certain issues European interconnectivity has yet to be achieved. When looking at the gas pipeline imports to the EU (Figure 3) it becomes clear that Russia has the largest share in pipeline imports in Europe (66%). Indeed, many CEEC receive their supplies exclusively from Russia (Figure 5) in particular through the pipeline via Ukraine. During Yeltsin’s reign energy cut-offs frequently occurred. Although the frequency has dropped (Larsson, 2007:77), since 2006 analysts have increasingly questioned the reliability of Russia (Smith, 2008). Russian Gas has also frequently cut off Georgia coinciding with politically important events such as elections, bilateral negotiations or Russian bombardment of Georgian territory (2001 and 2003). The 2006 and 2008 Gas Ukraine-Russia disputes have led Germany in particular to favour new pipeline projects to cut out the uncertain transit country Ukraine (Larsson, 2007). The opening of the second Nord Stream pipeline raised its capacity to 56.6bcm and directly connected Russia and Germany, Russia’s largest importer. In December 2012, the first construction phase of the South Stream project got underway, which will connect Bulgaria, Hungary and Austria to Russia. Ratner et al (2013:1) argues that “Russia has demonstrated a willingness to go to great lengths to maintain its hold on its European gas market share of gas”. 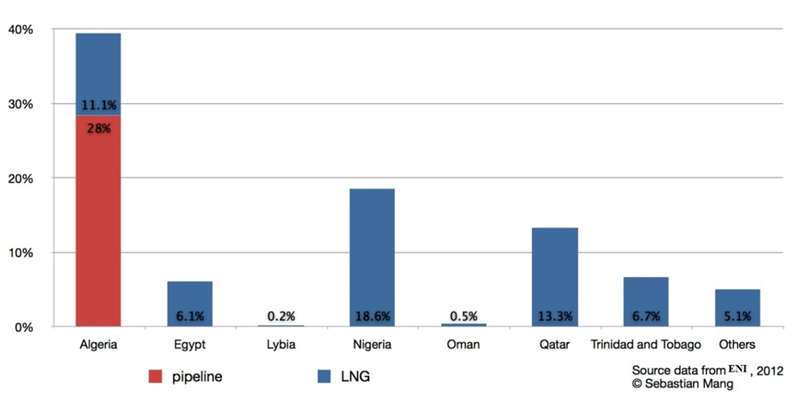 At present seven member states operate LNG import terminals. The proposed LNG terminals in Poland and Lithuania are particularly important and domestic political backing due to their heavy reliance on Russian imports. The costs of using pipelines rise linearly with distance, but LNG, which requires liquefaction and regarsification regardless of distance travelled have a high threshold cost but a much lower increase in costs with distance. Thus, while pipelines are more economical for short distances, longer distances favour LNG (Jensen, 2004:7). The break-even point when comparing pipeline gas with LNG is quoted as between 3000-4000km, whilst a standard new LNG supply chain, requires, $3-5bn for liquefaction, 2bn for shipping and a further $0.8-1bn per terminal for regasification. This method is therefore more expensive gas transport option and may be confined to rich and developed nations (Kavalov et al, 2009:11). Figure 5 shows the EU’s LNG imports from non-EU sources. LNG is becoming increasingly volatile as an energy source, as global demand for energy, especially in Asia, is increasing. Barclays has forecast LNG imports to Europe to fall by 70% by 2015, due to a booming Asian market especially Japan, China and India (Reuters, 2012a). After Fukishima, Japan in particular will be looking for increased LNG supply especially from Qatar, which represents a large proportion of LNG imports to Europe. With Britain having to renegotiate its gas deal with Qatar in 2014, the price of LNG is forecast to rise (BBC, 2013). After 2015 rising Australian and US LNG exports should push supplies back to current levels, however demand is also expected to rise (Reuters, 2012a). This section will address the political and security risks within the EU’s major supplying countries Russia and North Africa and the Middle East (MENA). Although the Caspian Region and Central Asia might be important for the EU’s energy security, as it is estimated to have proven gas reserves exceeding 28.317tcm (Ratner et al, 2013:18), currently the EU is not importing from this region, and therefore this region will be ignored. 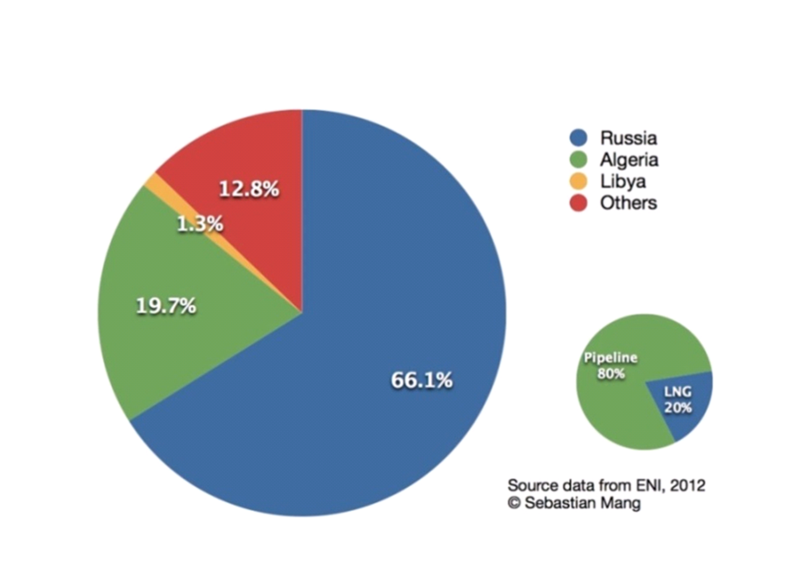 Russia is the EU’s primary gas supplier supplying 45% of all gas in 2011. Views on Russia are polarised between those who see Russia as a threat to the EU’s energy security and those who perceive Russia and the EU to be mutually dependent. The former argue that “Russia has systematically attempted to use energy” to influence its neighbours’ foreign policy, domestic policy and economic systems (Monaghan, 2005:5). More radical views argue that “the hallmark of President Putin’s power are the curtailment of liberty and pluralism at home and the single minded pursuit of Realpolitik by energy blackmail abroad” (Prins, 2005 cited by Monaghan, 2005:1) or arguing that “Oil is for Putin what nuclear warheads were to the USSR” (Monaghan, 2005:2). These views are based firstly on the nature of Russian state-controlled companies in particular Gazprom engaging in monopolistic and market-distorting actions. Gazprom owns a vast pipeline network, is the only company allowed to extract and export Russian oil and gas and owns or partly owns an array of subsidiary companies in the EU. The landmark anti-trust case launched by DG Competition on September 4th 2012 includes “allegations of illegal resale clauses to abusive denial of third party access to exploitative pricing, combined with a host of structural supply security and geostrategic questions” (Riley, 2012:2). Although the EU is working to solve these issues, Gazprom is widely seen to be counterproductive to the EU’s energy security objectives. While internally, the liberalisation of energy markets poses an opportunity for Gazprom to further enhance its dominant position, EU companies find it extremely hard to invest in the energy sector in Russia due to the high level of regulation of FDI in the energy sector. Therefore the playing field is not level, Gazprom acts in an abusive way within the EU’s energy market and secondly EU companies find it hard to invest in Russia. Smith (2008) argues that Russia has been undermining EU and NATO interests, through intimidation on the one hand and through the energy weapon on the other. He argues that the Ukraine and Georgia’s interest in NATO membership as well as efforts to route a new non-Russian oil and gas pipeline through Georgia was the cause of the War over South Ossetia and Abhkazia, which was meant to be a warning to the two countries that NATO membership will not be tolerated. Similarly, Smith argues that Russia cut off the Czech Republic one day after Prague signed an agreement on July 18, 2008 with America regarding the stationing of anti-missile radar sites in the Czech Republic. Smith is very sceptical of Russia’s excuse that technical difficulties with the pipeline caused the cut-off, and argues that it was politically motivated. The fear of Gazprom’s market dominance in the EU as well as Russia’s willingness to use Realpolitik to intimidate and influence national politics has led some analysts to doubt Russia’s reliability and to fear that Russia may ‘turn off the taps’ in order to pursue its geopolitical strategy. This view is increasingly put in doubt by many analysts who argue that in fact the relationship is characterised by mutual dependency. These analysts (Larsson, 2007 and Monaghan, 2005) argue that Russia is far more dependent on the EU (exporting 55% of its gas to the EU) than the EU is dependent on Russia (EU is 27% dependent on Russia). In 2012, President Putin estimated that half of total Russian government revenue came from oil and gas taxes, with others estimating even higher (Ratner, 2013:10). With most of this revenue coming from gas and oil exports to the EU, it is clear that dependence does not go in only one direction. It is true that pipelines are inflexible and limit EU’s capacity to diversify – especially for CEEC and Baltics – yet this inflexibility restricts Russian options equally. Moreover, the EU has increasingly invested into LNG, while Russia has not invested enough into such facilities. However, as Götz (2004:7) shows by drawing on the Russian Energy Strategy 2020, Russia is pursuing increased exports of gas to non-European markets. With increased exploitation of Eastern and Far Eastern Siberian gas fields, especially China, South Asia and the United States seem easier trading partners than Europe. Monaghan (2005) therefore points out that energy security is often about perceptions; therefore if Russia perceives the EU to be worried about Russian gas imports and its aim to diversify imports, Russia too will have to diversify its markets. This paper contends that while the EU and Russia are mutually dependent, the overall geopolitical approach does not necessarily reflect this. In subsequent chapters we will investigate whether the EU has been able to act on the mutual dependency. North Africa – Viable Solution? The existing suppliers to the EU in the Middle East and North Africa (MENA) supply the EU through both pipeline and LNG. 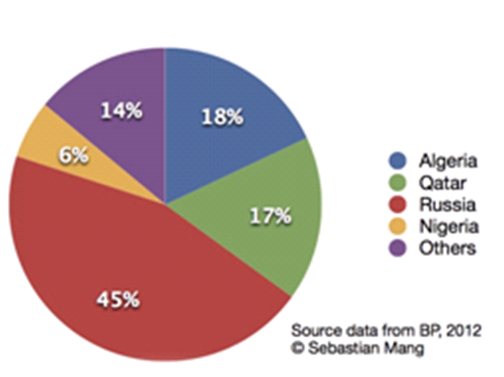 Algeria provides the most pipeline gas (19.7), with considerable LNG exports (15%); while Qatar is the leading LNG (53%) exporter to the EU (Figure 5). In addition to the relatively high gas imports the region has large gas reserves. The issue is not dependency but rather availability and reliability of supply. On the one hand, North Africa has been characterised by political and economic uncertainty, by high subsidies on gas consumption, high domestic demand, a difficult business environment, has had limited development of gas resources and faces security issues. In regard to the latter, instability in the area and terrorism stemming from northern Mali and potentially southern and eastern Libya is cause for concern (Youngs, 2011:62-63). This was recently highlighted when on January 16, 2013 terrorists seized a gas compound with foreign workers in south-eastern Algeria. Ramifications of this incident for the energy sector and FDI are yet to be established but it clearly highlights uncertainties for the region (Ratner et al, 2013:23). On a more positive note, recent regime change in Egypt and Libya pose an opportunity for a change of policies to promote the expansion and development of its gas resources. Additionally, Algeria has changed its hydrocarbon law to address shale gas extraction, which may be larger than its unconventional gas supply and this may open up possible doors for larger EU imports in the future. Overall therefore, the situation in the Middle East is characterised by concerns over its availability and reliability although there is cause for hope. This section aims to discuss successes, failures and limitations of the EU external energy policy of market governance and will be discussing the components of the Single Market and exportation in turn. External energy policy at EU level is characterised by market-governance. The basic aim is to implement the 1994 ECT successively to the EU’s periphery regions (Russia, Central Asia, South Caucasus, Ukraine, Balkans and southern Mediterranean) or in other words to develop inter-connecting energy systems between different geographical areas, based on EU regulatory norms and the EU’s acquis. The EU approach to energy security therefore is predicated on the spread east and southwards of internal European market rules Youngs (2007:2). to promote the interconnection of energy networks. Although this does present the EU with an opportunity, Braun (2011:2) argues that solidarity in the field of energy remains weak. The EU’s external energy policy is multi-faceted and is comprised of bilateral, regional and international agreements and policies. Although this essay will not describe each individual policy it will draw on individual agreements. Figure 6 gives an overview of the key agreements, treaties and dialogues with third countries. For more information on the individual agreements see Commission (2006a:37-42) for detailed description of agreements and Youngs (2007:2-4) or Prange-Gstöhl (2009) for commentary. Figure 6: EU Agreements with Third countries. The EU had begun to work extensively towards achieving its goals through this approach even before the increased legitimacy in the field post-Lisbon. The Commission (2006b:2) argues that energy security can be achieved “by the EU extending its own energy market to include its neighbours within a common regulatory area with shared trade, transit and environmental rules”. The EU needs “to convince non-EU consumer countries that world energy markets can work for them. If they were to conclude that the only route to security lay in bilateral deals, the risk of disruption of the energy system would grow”. This is more than a simple market-based model, as it does not only propose to achieve energy security through free market economics but rather it intends to transfer EU norms and aquis to third countries or in other words “regulatory boundary shifting” (Lavenex, 2004). Piebalgs (2006) argues that a ring of energy co-operation exists. The first is comprised of a complex and regulated EU internal energy market; the second is made up of those states who have signed up to the Energy Community, which has created a common Energy market based on EU norms between the EU and contracting parties; finally, the third group lie beyond the immediate neighbourhood, those which have no prospects of joining the EU. To identify the relationship of the EU externally, one needs to investigate the three rings. Young’s (2007:4) argues that the internal market “defines the EU’s substantive approach to energy security”. The Internal Single Market for Energy has been a long-term project of the EU, which started in the mid-90s. The first two Energy Packages involved opening and liberalising the electricity and gas market, establishing mandatory independent national regulators, increasing competition, and improving service quality and transparency. Considerable advances in the process of integration had been made and from the late 2000s more options for consumers to choose between energy providers, generally affordable prices despite increased oil prices and better services were seen in the EU. A major hindrance to the liberalisation was the exclusive control of transport networks by major energy producers, which precluded competitors from market access. The Third Energy Package (TEP) (Commission, 2007a;2007b) solved the problem by separating supply and production activities from the transmission and distribution systems (so called Ownership Unbundling), which member states are required to implement by Oct. 31st 2014. The Commission (2012) has put forward the Single Market Act II, which proposes to “Improve the implementation and enforcement of the TEP” and enhance integration of energy markets and reduction of physical barriers between member states. Therefore, internally the EU is moving towards increasingly integrated and liberalised markets, a model it intends to export to external partners. Fundamental doubts however persist over single market energy norms. If the internal market is supposed to set the foundations for the rule-based, market-oriented external energy policy a comprehensive and united single market needs to be in place. In 2006, the Commission criticised all governments, except the Dutch, for failing to meet market opening commitments they had already signed up to. Additionally, member states had until March 1st 2011 to transpose the TEP, which Bulgaria, Estonia and the UK have yet to complete and have thus been referred to the European Court of Justice (Commission, 2013). Moreover, high-profile cases, such as Spain’s hindrance of EON’s bid for Endesa, have led some analysts to argue that Europe is returning to energy nationalism (Vos, 2006:133-37). Furthermore basic infrastructure links are still largely absent between member states (Youngs, 2007) although TEN-E is aiming to overcome these issues. This has direct implications for the external strategy; the absence of both pan-European market mechanisms and sufficient physical interconnection prevents the EU from responding as a single entity to external energy shocks (Youngs, 2007:6). The most institutionalised and probably most comprehensive tool at the EU’s disposal is the European Energy Community, which aims to create a “common regulatory space around Europe” (Commission, 2006a:16). The treaty defines the tasks of the Energy Community as the creation of a stable regulatory and market framework, creating a single regulatory space for trade in network energy, enhancing the security of supply and providing the regulatory environment for connections to Caspian, North African and Middle East gas reserves, improving the environmental standards, and developing market completion. Within this framework the EU has mandated that contracting parties need to transpose various energy, environmental and competition directives as well as the TEP (Energy Community, 2010). Contracting countries includes those acceding to the EU (Croatia in July 2013), those that are candidates (Macadonia, Montenegro, Serbia and Turkey), have applied for membership (Albania), are recognised by the EU as potential candidates (Bosnia and Herzegovina and Kosovo) or have aspirations for closer ties and possible accession to the EU (Ukraine, Georgia and Armenia). For many countries who have signed up to the Community, the EU is a regional hegemon and accession provides incentives, therefore they see increased integration during or before candidacy to be beneficial (Deitz et al, 2007:4). In the case of the European Energy Community, as Padgett (2009:4) argues contracting parties share the EU’s belief that a larger integrated market for security of supply is beneficial. At the same time, due to conflicting interests in market and non-market forms of contracting – especially in regard to bilateral long-term supply agreements with Russia – the agreement has adopted a light-handed application of the aquis allowing for exemptions from full market principles. As Renner (2009:12) argues, typical remaining problems involve subsidies and politically motivated low level energy tariffs, missing metering and billing of customers and hence high rate of non-payment, a lack of both domestic generation and cross-border transmission infrastructure and generally a low level of investment in production, transmission and distribution as well as some secondary legislation not being transposed. National companies remain in the dominant position and regulatory authorities are under-empowered and lack independence from government and therefore market rules and competition are slowly emerging (Dietz et al, 2007:176-18; Padgett, 2009:22). Therefore, the EU has achieved limited success in a relative short period in exporting its own, not yet entirely developed market norms into its periphery, with the help of accession conditionality and inclusion into the EU’s energy market. A paradoxical situation emerges due to the unfinished nature of the EU regulatory regime and it expanding these policies (Belyi, 2012:20). The partnership model of Euro-Mediterranean (EUROMED) energy cooperation is a hybrid of multilateralism and bilateralism with flexible political commitments organised on an intergovernmental basis. In the absence of accession incentives, AA under the ENP provides a far more fragmented and weak platform for energy. While Algeria has only recently, in 2011, officially indicated it was willing to start exploratory negotiations regarding an Action Plan under the renewed ENP, Egypt is committed to its AA and Morocco has expressed significant interest in upgrading its status in the ENP (Belyi, 2012:22; Padgett, 2009:5). Overall however Padgett argues that the EUROMED is insufficiently funded. Mediterranean energy producers are less inclined to include market principles. Algeria relies on exports to Europe, but has historically preferred long-term bilateral supply. It has tended to solve issues with the EU through dialogue and consultation around mutual interests (Khelil, 2003). Furthermore it has resisted institutionalised multilateral relations (Darbouche, 2007:382) until recently. Algeria is sceptical of increased cooperation on gas in particular, is however more open to the creation of a Euro-Maghreb electricity market. In contrast, Egypt which can be seen as an emerging producer of gas, has stronger interests in accessing EU markets and has long-term commitments to liberalise, however the domestic market remains underdeveloped therefore potential for integration is limited. Padgett (2009:4) argues that it looks for individual forms of bilateral cooperation rather than regional agreements, as the latter operate at the lowest common denominator. With aspirations of becoming a regional gas hub, it has issued strong commitment to cooperation in the Euro-Masreq gas market project. For current energy imports in particular gas, the EU is heavily dependent on Algeria and on Egypt to a lesser extent. Broadly however Morocco, Tunisia, and Egypt perceive increased integration into the EU as an opportunity mostly for cultural and economic reasons, although not necessarily for better governance, while Algeria and those from the Middle East take this cooperation less seriously (Del Sarto & Schumacher, 2005:19). In 2006 the Algerian government reversed energy market liberalisation and in 2007 increased prices against Spain, as well as revoking its €5 billion contract with Repsol and Gas Natural. Likewise, Paris signing a new bilateral energy treaty with Algeria in 2006 shows the prevalence of the bilateral dimension in the relationship (Youngs, 2011:59-61). Not only does this raise questions of reliability, availability and affordability; but it also shows that the EU policy towards Algeria is fragmented and still based on bilateral or a geopolitical approach. The above has shown that member states are still following a geopolitical approach to energy security, that programmes are insufficiently funded and that the response to increased EU involvement has been inconsistent. Russia has been even more reluctant to conform to EU norms. The ECT is seen to be “the first comprehensive multilateral agreement which contains rules for both investment protection and for trade within a single international instrument” (Paasivirta, 1998:197). These treaties establish common rules for energy trade, investment and transit rights based on the EU model. In 2009 Russia rejected the ECT and the EU has had to incorporate its market-governance polices into the EU-Russia energy dialogues and the renegotiation of the expired Partnership and Cooperation Agreement (Belyi, 2012:26-27). Russia has continued to be resistant of these efforts. Russia has shown little sign of wanting to conform to EU norms (Vahl, 2006:25). With the majority of energy companies having signed bilateral deals with Gazprom and governments mainly working with Russia on a bilateral level, it becomes clear that companies and governments have little hope in EU norm transfer, although the EU now has more high-level political dialogue with Russia than any other third country except the US. Wolfgang Schüssel, President of the Council argued that the EU-Russia relations should be about “buying and selling oil and gas” and this “is a purely commercial activity; it is not politics” (CEPS, 2006:5). While increasingly member states have voiced their opinion of working towards a geopolitical approach. From the outset, it is difficult for the EU to export its energy norms to third-countries, due to the project being a ‘work in progress’ at home. The EU has seen limited success in the form of the European Energy Community, however was less successful in the cases of North Africa in particular Algeria and Russia. The market governance approach however has been undermined by individual member state’s geopolitical approaches to energy security. This conflict between a market and geopolitical approach can also be identified in the relationship with Russia, where increasingly member states have voiced their concerns. So clearly fault lines between member states and between the Council and the Commission have emerged. Commissioner Ferrero-Waldner (2006) argues, “EU external energy policy [should] be based on a single approach and speaking with a single voice”. While contrary to this, Lithuanian President Valdas Adamkus, as well as other member states, have argued that while Russia has insisted on approaching energy in such an overtly geopolitical manner, the EU needed to respond in kind (Youngs, 2007:7). The politics of creating a single EU external energy policy can therefore be described as a conflict between markets and geopolitics. It has been shown that on the EU level there is a conflict between markets and geopolitics, that the EU is fragmented internally and in its dealings with third countries. Consequently it is important to understand the member state level to understand why the EU is so fragmented. In regard to Russia this chapter has shown that “the EU was weak and divided in the face of an increasingly powerful Russia, looking in vain for cooperative and market-based solutions rejected by Moscow” (Youngs, 2011; 98). This chapter will discuss (a) the patterns of energy security; (b) how the EU’s main supplier, Russia, uses the fragmentation of EU and disunited member state policy towards Russia, for its own advantage and (c) whether LNG poses a viable solution to Russian dependency on Russia. The previous chapter illustrated the multi-faceted factors involved in Coq and Paltesvas (2009) model. They have developed indicators to highlight the core issue of short term risk of security of supply and dependency in gas, coal and oil markets in Europe. The Risky External Energy Supply (REES) index incorporates discussed factors. Further the Contribution to EU Risk Exposure (CERE) index weights the REES against Member States’ share in total EU energy imports to portray the wider EU risk. The benefit of the model proposed by Coq & Paltseva over other models, is that it examines Energy sources separately, as substituting one energy source for another in the short term is difficult and/or costly (Coq & Paltseva, 2009: 4474-4475). The first group of relatively high index countries is characterised by no indigenous gas resources, mainly importing from non-EU suppliers mainly Russia with gas making up a relatively large proportion of the energy mix. This group includes Austria, Bulgaria, Czech Republic, Hungary, Latvia, Lithuania, Romania and Slovak Republic. The second group is characterised by medium-level of gas supply risk as a result of having increased diversity of supply and/or less reliance on gas in their energy mix. These countries include Estonia, Finland, Germany, Greece, Italy, Ireland, Poland, Portugal, Slovenia and Spain. The final group has low-level of gas supply risk due to considerable indigenous resources, they receive mainly imports from EU/Norway and/or gas represents a relatively low proportion of their energy mix. This group is represented by Belgium, Denmark, France, Netherlands, Sweden, and the United Kingdom. When looking at the CERE index, Germany, Italy and Spain make up a large proportion of the EU-level risk exposure due to the size of their energy imports relative to other member states. Smaller countries such as Hungary and the Slovak Republic also make up considerable EU-level risk, due to almost entirely importing gas from Russia. Looking at the groups and drawing on Figures 7 and 4 a few general trends can be highlighted. The first group is made up of Central and Eastern European nations that have traditionally been dependent on Russian gas, in particular pipeline gas supply. The second is made up of countries that are dependent on pipeline gas supply from non-Russian sources as well as on LNG supply (Belgium, Portugal and Spain). LNG is generally believed to represents less risk than pipelines, these member states are nevertheless represented with medium-level gas supply risk, therefore within this category we split the group into those largely dependent on Russia and those who are supplied by non-Russian and LNG. Finally the latter group is made up entirely of countries supplied mainly by EU/Norway, LNG and/or have considerable indigenous resources (Denmark, Netherlands and UK). For the purpose of this paper we will be grouping the first two groups into a sub-chapter and the latter two groups into a second sub-chapter due to similarities. Within this group, some countries in particular the Baltics and CEEC have historically been dependent on Russia, and due to limited alternative infrastructure found it hard to diversify their energy sources, although the TEP has worked towards increased integration. Germany has identified Russia as a long-term partner and has used long-term contracts, joint long-term investments and good political relations to achieve energy security through a geopolitical approach. Having already discussed the two perspectives of Russian energy imports to the EU in chapter 3.3.1 this section will show the EU’s failure to think in terms of mutual dependency and additionally how the fragmented EU policy allows Russia to be able to dominate the relationship. Over forty cut-offs of energy supplies have occurred against the Baltic and Commonwealth of Independent States (CIS) countries since 1991, with fifteen occurring during Putin’s time in office. Furthermore, on at least three occasions serious threats were issued but no action was taken (Larsson, 2007:81). Larsson (2007:81) argues that on at least seven occasions of cut-offs directed at CIS and Baltics, political demands were put forward, while he also argues that all cut-offs are in one way or another a political statement. Larsson notes, that Russia is less willing to use politically motivated cut-offs against CEEC, although disputed by other analysts such as Smith (2008). With the Baltics being most under pressure from Russia, entirely dependent on Russian Gas and Gazprom being the only Gas supplier, the Baltic countries in particular face availability and affordability concerns. Looking at the REES index, we can see that Lithuania (20.1), Latvia (21.0) and Estonia (10.3) have very high REES indices, with Lithuania posing limited, but in comparison to Estonia and Latvia the highest risk to overall European supply risk at 4%. Lithuania has forced Gazprom to unbundle its ownership, of both supply and production, through the TEP, and has sold the supply facilities to a polish energy firm. Lithuania has also planned to build an LNG terminal in Klaipeda to diversify its imports away from Russia towards in particular Qatar (Reuters, 2012b). Gazprom has not liked these developments in Lithuania and has in retaliation given Latvia and Estonia 15% discount on gas for 2011. This has created outcry in Lithuania and the government has threatened to sue in the UN International Arbitration Tribunal over the issue. In 2010 Lithuania asked Gazprom to allow 15% of imports to be priced on spot-markets, which they refused and Lithuania threatened to go to the UN International Arbitration Tribunal. Gazprom responded, “If it does come to arbitration proceedings, we are pretty confident […] God help them if someone takes a risk to go to arbitration” (Bryza, 2012). So not only does Russia use supply cut-offs to further its economic or political aims, but it also uses favourable treatment of countries to exert influence and threats. Still, although Russia has benefited historically from the liberalization and environmental policies of the EU in regard to the Baltics and CEEC, the TEP in particular has allowed member states to reduce the dominance of Gazprom in their energy sectors. Other analysts such as Larsson (2007) stress the distinction between the Baltics and former Warsaw Pact members, which have witnessed less Russian intervention. In the case of Poland, its EU membership is an important factor as Poland has successfully uploaded bilateral disputes to the EU level. For instance, Poland was able to defer negotiations of a new EU-Russia Partnership and Cooperation Agreements by several months following a Polish-Russian dispute over Poland’s meat exports to Russia. Commission President José Manuel Barroso explicitly stated that “a Polish problem is a European problem”, as the EU was “based on principles of solidarity” (Roth, 2009:8-11). However as seen in the Baltics and in other examples, this solidarity has rarely been seen towards Russia. As long as a common and effective EU energy policy for diversification of gas in particular for the Eastern members, is not in place, these states have little choice but to accept Russian prices. Russia has not aimed cut-off at Western states as is known (Ahrend & Tompson, 2004:21), but issues of concern exist, especially as these states are affected by Russia’s policy towards transit countries. Within the high and medium category, Germany is the most important country with a high REES (5,5) and CERE (11%) index because of its relative importance for the EU economy, politics and high gas imports. One can therefore not discuss EU Energy policy without discussing German energy security. This section will concentrate on the relationship between Germany and Russia to show that Russian policy is very different towards Germany than towards Baltic and CEEC and even other Western European countries. Putin’s foreign policy strategy towards the EU consisted of gaining support of the German government. With Putin’s career as a German specialist and being a German speaker, he was able to gain the support of German Chancellor Schröder who was willing partly as he wanted to be the leading figure in the West’s relationship with Russia (Schröder, 2001). Putin was also able to gain support among the German people as a result of the unpopularity of the Bush administration and its involvement in Iraq. Furthermore, the guilt factor was relevant as some Germans feel that their country owes Russia more political leeway due to guilt of WWII (Smith, 2008:13). Smith (2008:12-14) shows that the relationship was based on informal relationships between Putin, Matthias Warning – a Dresdner Bank official, former Stasi officer, reportedly Putin’s East German intelligence contact and current deputy CEO of the Nord Stream Company – Schröder – who later became CEO of the Nord Stream Company. Reason for its involvement with Russia was not only based on informal relations, Schröder argued that Russia was politically stable – going as far as describing Putin as a “flawless democrat” (FAZ, 2012) – has the world-wide largest hydrocarbon reserves and therefore was a reliable supplier of energy. Cooperation has been facilitated by specific thematic working groups within the German-Russian Energy Cooperation which was started in 2003, and the German-Russian energy summit. These close ties are unrivalled by other EU member states, which have increasingly argued for diversification of energy supply from Russia (Geden et al, 2006:18). This can be seen in Russian relationship with foreign energy firms operating in Russia. Companies from the UK, US, Netherlands and Japan have had large shares of their energy investments confiscated in Russia, while German firms have been left relatively untouched (Smith, 2008:13). Indeed in July 2004, German companies struck a deal with Gazprom allowing German companies to partake in the entire processing chain of Russian gas production, which other countries’ companies are forbidden to do. In return German companies are to support Gazprom’s planned expansion into the European gas market (Geden et al, 2006:18). With politicians, society at large and businesses supporting Germany’s close relationship with Russia this relationship is set to become ever more important in the future after Germany’s nuclear exit, which is set to be completed by 2022 (Cala, 2011). Merkel’s policy towards Russia, has gone some way to shape the relationship into a more balanced and transparent relationship. This was especially highlighted in her position towards Human Rights, her meeting with Mikhail Kasyanov an opponent of Putin and the more cautious approach taken towards Russia since the Georgian crisis in 2008 (Timmins, 2011:191). Merkel has however been criticised for “Pursuing the same Russia policy with Russia’s President Dmitry Medvedev as Schröder did with Putin, and as her political mentor Helmut Kohl did with Boris Yeltsin” (Guardian, 2009). This does not bode well for the EU’s single voice and for in particular the eastern member states in particular, which would benefit most from increased integration. Germany has been the leading opponent of many EU policies on Energy such as the TEP and has resisted liberalizing its market thus allowing other European firms to integrate. Additionally, Smith shows, that EON and RWE have blocked efforts to build more electricity and gas interconnectors with neighbouring states, which would go some way to alleviate issues of lack of cross-border connection in the EU. Generally, Germany, with France and Italy, has tried to stop energy market reform within the Union, thus preventing greater competition and transparency. Finally, within NATO’s efforts to develop a common policy towards the growing dependency of NATO, it has consistently opposed the issue of Russian energy tactics. Timmermann (2007:122) has argued that the German relationship with Russia will continue to be pursued through the EU and bilaterally. Overall there is a conflict between German “solidarity with Russia” and the EU’s “solidarity on Russia” (Timmins, 2011:198). As we have seen, Germany does not only receive preferential treatment from Russia, but Germany has also blocked increased EU integration and liberalization, and has allowed firms to block efforts to increasingly build cross-border infrastructure. While Central and Eastern states and in particular the Baltics have experienced a completely different relationship with Russia; a relationship characterised by markets dominated by Gazprom, informal links between business and government and Russian Gazprom and government. So clearly, Russia understands the dynamics within the EU and has set about to gain support from the largest and most important actor in the EU, while working against EU norms and competition law in, especially Eastern states. While Large, wealthier Western states such as Germany, Italy, France and Austria have well developed energy firms with sufficient technical and financial resources and indeed political backing. To the East however, firms are less established and Russia has more leverage over these. Having said this, as I have shown Poland’s ability to upload bilateral trade disputes to the EU level, through calling on the solidarity clause has highlighted that the EU can act together against Russia. Secondly, Angela Merkel has increasingly spoken out against Russia’s Human Rights record, which was differs from Schröder’s approach. Germany, has therefore shown that it can stand up to Russia and has portrays a willingness to criticise Russian policies. Generally, the EU will not be able to build on its mutual dependency on Russia as long as the EU does not develop a single voice vis-à-vis Russia. Having shown that certain member states are highly dependent on Russia and the differentiated approach of Russia towards these members, this subchapter investigates the countries under the heading medium and low dependency. The importance of this group is firstly, that production is decreasing which will lead to increased imports and secondly that they are supplied by LNG. This section will cover the latter, by discussing Spain’s gas market. Gas is the second most important fuel in Spain, after oil. 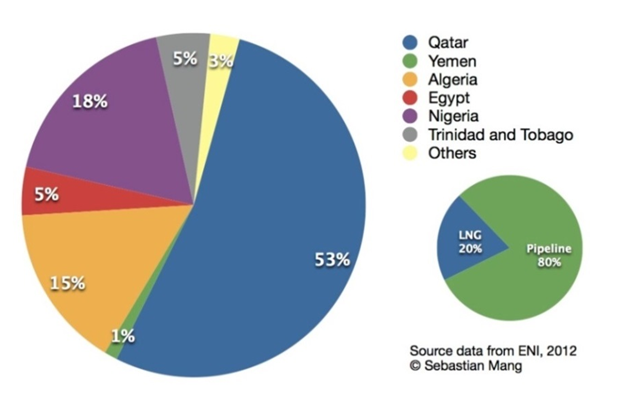 Its gas supply is provided by a large variety of energy providing countries through pipelines from Algeria and 7 LNG terminals (2 being proposed) providing 62% of its gas supply from mainly Algeria, Egypt, Nigeria, Qatar and Trinidad and Tobago. Its gas demand grew by 10% between 2007 and 2008 but fell between 2008 and 2009 due to the economic crisis, but remains the 3rd largest LNG market after Japan and South Korea (IEA, 2009:19). Spanish energy markets seem to be very good with gas regulation complying with all three Energy Packages It has legislated that energy importing companies maintain 20 days of consumption in reserve, has reduced the dominance of the traditional gas supplier, Gas Natural (from 64% in 2002 to 46% in 2008), with 17 companies supplying gas to industry and 5 to residential markets and the IEA has noted that it is “fairly competitive” (IEA, 2009:65; IEA, 2011:14-20; Federico, 2010). However various issues persist which have resulted in its medium supply security risk REES index of 3.3 and CERE index of 6%. Firstly, as portrayed in Chapters 3.3.2 and 4.2.1, political and security risks are involved in the energy relationship with Algeria. In particular the 2007 price hike against Spain, as well as the revocation of the €5 billion contract with Repsol and Gas Natural. Secondly, there is lack of cross-border infrastructure. Spain is connected with Portugal, France and Morocco. The cross-border interconnectors with Portugal have sufficient spare capacity, while the two interconnections with France face congestion (IEA, 2009). As already noted Spain relies to nearly two thirds on LNG. Investments into gas infrastructure are obligatory and follow a national infrastructure investment plan, which includes LNG facilities and gas storage facilities and is set at around 7% net of tax per year. Furthermore, Spain has LNG terminals, which are open to third party access, which have increased competition by allowing new firms to enter the market. Overall therefore, Spain has become the leader in LNG imports and indeed in gas liberalization (IEA, 2009:21). Three main issues can be identified for LNG imports. Firstly, as shown above the cost of LNG is higher than for pipeline. Secondly, domestic gas storage (10% of annual demand) is considerably less than other major EU countries such as Germany or France, which reduces the ability to absorb short-term supply shocks (Frederico, 2010:10). Thirdly, global LNG markets are becoming more volatile as highlighted in 3.3.2. and this could cause supply cut offs for Spain in the future especially until 2015. Spain has the ability to become a European LNG hub, if it were to invest heavily into its LNG facilities as well as interconnectivity with France, thus being connected to other member states. Spain has also seen the positive effects of increased liberalization and competition in its markets. Both Industry and Consumers now have more freedom to choose between companies. Through LNG Spain has been able to diversify its imports. This chapter has shown the patterns of energy security. To the East states are dependent on Russia. Central and Eastern Europe, and in particular the Baltic States, are most affected by this dependency and have felt the brunt of Russian realpolitik. Germany on the other hand has a strategic partnership with Russia, with German-Russian relations remaining high. German firms are allowed more freedom in Russia and the German public having a positive opinion of Russia, having benefited greatly from the partnership. This beneficial role has severely harmed the EU’s response and solidarity. To the West and the South, we see states relying more heavily on indigenous supply (UK, Netherlands and Denmark), EU sources in particular Norway and/or LNG imports. To characterise the benefits of LNG imports, we have drawn on Spain to show that LNG has put Spain at the forefront of diversification and therefore does present a viable solution for EU. Indeed “efforts aimed at developing LNG in Europe can make a significant contribution to enhanced national energy security, especially in central and eastern Europe” (Council of Europe, 2010). Eastern states and Spain – although other low and medium dependency countries especially France do not share Spain’s view – have argued for increased EU integration and are arguing for a market-based response, while Germany in particular has favoured long-term, bilateral agreements or a geopolitical response. This paper agrees with Swieboda (Baev et al, 2008:10) who notes that, “without energy solidarity and commonly defined energy interests, a common EU energy policy will remain elusive” and the EU needs to move “from vacuous rhetoric to practical action”. The aim of this paper was to answer the following questions: Firstly, to what extent the EU presents a coherent external energy policy? Secondly, what kind of gas security pattern can be identified? And how the fragmentation of the EU’s policies has led to the dominant position of Russia? The overarching EU external energy policy differs greatly between regions, that overall therefore the EU does not present a coherent policy towards energy security. Its policy, in fact, remains overall weak, insufficiently funded, fragmented and individual member states geopolitical actions have undermined its success. By examining the European Energy Community we have seen that the EU has been able to transfer its own aquis to third countries; yet progress is slow and restricted to those countries which the EU can entice through accession conditionality. In the case of North Africa, especially Algeria, and Russia, the EU has achieved the least success in exporting its norms. Most importantly however, the prerequisite of having a coherent and well established single market for energy has not yet been met and consequently the project of exporting its norms is severely undermined. Before being able to achieve a coherent Energy Policy, internally as well as externally, member states need to agree on a mixed approach to energy security; an approach that is based on not only the markets, as it is today, but also on geopolitics. The need for such a dual approach comes from the different energy security risks the EU’s members are facing. The EU is very much divided into CEEC, which are predominantly the medium to high risk energy security risk states because of their dependency on Russian gas and poor bargaining power; Germany which has a very preferential relationship with Russia and those states in the low to medium category that receive most of their resources from indigenous supply, EU/Norway sources or through LNG. Having shown that the EU’s indigenous supply is dwindling, countries in the latter category will increasingly need to derive their gas sources from different supplies, which will present a further challenge for the EU. By highlighting Spain’s success in diversifying its imports through LNG, this paper emphasised that LNG presents a possible solution to the EU, although issues with supply may be an issue in the future due to increased global demand. Although this paper has agreed with the EU and Russia being mutually dependent, the incoherence of EU policy towards Russia, the fragmentation of policies – in particular the conflict between German policies and Eastern European policies towards Russia – have undermined mutual dependency and have let Russia become the dominant partner, with the EU being nervous to confront it. Throughout this paper we have seen that there is a conflict between a market-based approach and geopolitics, in general between; eastern members, who have been under pressure from Russia and are looking for more EU involvement, and Germany which has been happy with its geopolitical approach; an EU market-governance approach and geopolitical relationships; the Commission and member states who are not willing to upload more sovereignty and/or do not want to increasingly liberalise their markets; and between Russia’s geopolitical approach and the EU’s market-governance approach. Before the EU can become a coherent energy actor, it needs to achieve consensus between all member states. In particular it needs to act with a single voice towards Russia. For this to be possible the EU needs to be given more responsibility and thus the treaty base needs to be strengthened. As shown the EU currently only has legitimacy to act through a market-governance approach, but to successfully convert its mutual dependency with Russia, it needs to add a geopolitical component. This paper has looked at limited examples and agreements, to assess the EU’s approach and the Member States approach fully, one needs to look at each individual agreement and member states policies. This is indeed necessary so that the EU can prove the benefits of increasing integration. From my analysis it has become clear that the first priority is to achieve a single voice vis-à-vis Russia. The situation of Eastern countries in particular would be strengthened by this, however in my opinion all countries would benefit, especially in the future when EU supplies are depleted. The EU has a strong negotiating position towards Russia as a result of their mutual dependency and should take advantage of it. Second, the EU needs to fully implement the single market for the external element to work coherently. Ahrend, Rudiger and Tompson, William, 2004. Russia’s Gas Sector: The Endless Wait for Reform? Paris: Organisation for Economic Co-operation and Development (OECD), (ECO/WKP (2004/25)). Anduara, Sami, et al, 2010. Towards a European Energy Community: A Policy Proposal. Paris: Notre Europe, March 2010. Baev, Pavel et al, 2008. Pipelines, Politics and Power: The future of EU-Russia energy relations. London: Centre for European Reform. BBC, 2011. Nord Stream gas pipeline underwater construction starts [online]. BBC news, 9th April, 2010. Available from: http://news.bbc.co.uk/1/hi/business/8607214.stm [Accessed 20th April 2013]. BBC, 2013. UK may face power shortages as 10% of energy supply is shut down. BBC news, April 4th, 2013. Available from: http://www.bbc.co.uk/news/uk-22031871 [Accessed 10th April 2013]. Belyi, Andrei, 2012. EU External Energy Policy. Polinares, 69. BP, 2012. Energy Outlook 2030 [Online]. London: BP. Available from: http://www.bp.com/extendedsectiongenericarticle.do?categoryId=9048887&contentId=7082549 [Accessed 13th March 2013]. Bryza, Matthew, 2012. Baltic Energy Security: Today’s Historic Opportunity [Online]. ISN Zurich, 31st October 2012. Available from: http://www.isn.ethz.ch/isn/Digital-Library/Articles/Detail/?id=154125 [Accessed 23rd March 2013]. Braun, Jan Frederick, 2011. EU Energy Policy under the Treaty of Lisbon: Between a new policy and business as usual. Politics and Institutions, EPIN Working Papers. Cala, Andrése, 2011. Russia Stands to Profit From Turn Away From Nuclear Power [online]. New York Times, June 14th 2011. Available from: http://www.nytimes.com/2011/06/15/business/energy-environment/15iht-sreGERMANY15.html?adxnnl=1&pagewanted=all&adxnnlx=1366888591-cMUfDzAFxMjDI7AoFevTSg [Accessed 23rd March 2013]. CEPS, 2006. Neighbourhood Watch. CEPS, Issue 16(May 2006). Chechini, Arianna, et al, 2009. Long-Term Energy Security Risks For Europe: A Sector-Specific Approach. CEPS: Working Document(309). Commission, 2006a. A European Strategy for Sustainable, Competitive and Secure Energy – What is at stake. Brussels: Commission (SEC (2006) 317/2). Commission 2006b. An External Policy to serve Europe’s Energy Interests. Brussels: Commission (S160/06). Commission, 2007a. Directive of the European parliament and of the council amending Directive 2003/54/EC concerning common rules for the internal market in electricity. Brussels: Commission, (COM(2007) 528 final). Commission, 2007b. Directive of the European parliament and of the council amending Directive 2003/55/EC concerning common rules for the internal market in natural gas. Brussels: Commission, (COM(2007) 529 final). Commission, 2012. Single Market Act II: Together for new growth. Brussels: Commission (COM(2012) 573 final). Commission, 2013. Internal energy market: Commission referes Bulgaria, Estonia and the United Kingdom to Court for failing to fully transpose EU rules. Brussels: Commission (IP/13/42). Coq, Chloe Le and Paltseva, Elena, 2009. Measuring the security of external energy supply in the European Union. Energy Policy, 37(11), pp. 4474-4481. Council of Europe, 2010. Enhancing Europe’s energy security through greater use of liquefied natural gas. Strasbourg: Council of Europe (Resolution 1774(2010)). Darbouche, Hakim, 2008. Decoding Algeria’s ENP Policy: Differentiation by Other Means? Mediterranean Politics, 13(3), pp. 371-89. Deitz, Laura., et al, 2007. The Energy Community of South East Europe: Challenges of, and Obstacles to Europeanisation. Norwich: CCP (Working Paper 08-4). Del Sarto, Raffaella and Schumacher, Tobias, 2005. From EMP to ENP: What’s at Stake with the European Neighbourhood Policy towards the Southern Mediterranean? European Foreign Affairs Review, 10(1), pp. 17-38. Energy Community, 2010. Recommendation of the Ministerial Council on the implementation of amendments to the “acquis communautaire on energy”. Vienna: Energy Community (2010/02/MC-EnC). ENI, 2012. World Oil and Gas Review [Online]. Rom; ENI. Available at: http://www.eni.com/world-oil-gas-review-2012/wogr.shtml [Accessed 23rd March 2013]. Elkind, Jonathan. 2010. Energy Security: Call for a Broader Agenda. In: Carlos Pascual and Jonathan Elkind, eds., Energy Security: Economics, Politics, Strategies, and Implications. Washington, DC: Brookings Institution Press, pp. 119-148. Faas, Henryk, et al, 2011. European Security- A European Perspective. In: Adrian Gheorghe and Liviu Muresan, 2011. Energy Security. Dordrecht: Springer, pp. 9-21. FAZ, 2012. Schröder: Putin weiter „lupenreiner Demokrat“ [Online]. Frankfurter Allgemeine Zeitung, March 7th 2012. Available at: http://www.faz.net/aktuell/politik/ausland/nach-der-wahl-in-russland-schroeder-putin-weiter-lupenreiner-demokrat-11675278.html [Accessed 10th April 2013]. Federico, Giulio, 2010. The Spanish Gas and Electricity Sector: Regulations, Markets. IESE Business School: Reports of the Public-Private Sector Research Centre (5). Ferrero-Waldner, Benita, 2006. Conference: Towards an EU External Energy Policy to Assure a High Level of Supply Security. Brussels: Commission (SPEECH/06/710). Gas Naturally, 2012a. 15th Febuary 2012, Member State Forum [Online]. Available at: http://www.gasnaturally.eu/eventsmanager/1/35/Member-States-Forum [Accessed on 10th March 2013]. Gas Naturally, 2012b. Natural gas, contributing to Europe’s energy and climate goals [Online]. Available at: http://www.gasnaturally.eu/uploads/Modules/Publications/gn—flipbook—(update-oct.-2012).pdf [Accessed on 10th March 2013]. Geden, Oliver et al, 2006. Perspectives for the European Union’s External Energy Policy: Discourse, Ideas and Interests in Germany, the UK, Poland and France. Stiftung Wissenschaft und Politik, German Institute for International and Security Affairs, Working Paper (FG1, 2006/17). Gény, Florence, 2010. Can Unconventional Gas be a Game Changer for European Gas Markets? The Oxford Institute for Energy Studies, NG46, December 2010. Götz, Roland, 2004. Russia and the Energy Supply of Europe: The Russian Energy Strategy to 2020. Stiftung Wissenschaft und Politik, German Institute for International and Security Affairs, Working Paper (FG5/2005/6). Haighighi, Sanam Salem, 2006. Energy Security – The External Legal Relations of the European Union with Major Oil and Gas Supplying Countries. Oxford: Hart Publishing. IEA, 2009. Energy Policies of IEA Countries: Spain. Paris: IEA. IEA, 2011. Oil & Gas Security: Emergency Response of IEA Countries: Spain. Paris: IEA. IEA, 2012. World Energy Outlook 2012. Paris: IEA. Jensen, James, 2004. The Development of a global LNG Market: Is it likely? If so When? Oxford: Oxford Institute for Energy Studies. Kavalov, B., 2009. Liquefied Natural Gas for Europe – Some Important Issues for Consideration. Commission: Joint Research Centre. Kecse, Zsuzsanna Réka, 2010. The Role of Liquefied Natural Gas in Europe. International Relations Quarterly, 1(4). Khelil, C. (2003) Statement: Ministerial Summit on the Gas Pipeline Algeria-Italy, April 14, Rome [Online]. Available from: http://www.mem-algeria.org/actu/ministre/allocutions/summit_gaspipe_dz-it.htm [Accessed 23rd March 2013]. Larsson, Robert, 2007. Nord Stream, Sweden and Baltic Sea Security. Stockholm: Defence Research Agency. Lavagno, Evasio et al., 2009. The Europeanization of Member States’ Energy Security Policies. Madrid: Universidad Nacional de Educación a Distancia (UNED) & Universidad Autónoma de Madrid (UAM). Lavenex, Sandra ,2006. Shifting Up and Out: The Foreign Policy or EU Immigration Control. West European Politics, 29(2), pp. 329-350. EU, 2007. Treaty of Lisbon amending the treaty on european union and the treaty establishing the european community. Lisbon: Official Journal of the European Union, (2007/C 306/01). Luft et al, 2011. Energy security and climate change: A tenuous link. In: Benjamin K Sovacool, 2011.The Routledge Handbook of Energy Security. London; New York: Routledge. Monaghan, Andrew, 2005. Russian Oil and EU Energy Security. Swindon: Conflict Studies Research Centre, 05(65). Hürriyet Daily News, 2012. South Stream not a rival to TANAP or Nabucco, energy minister says. Hürriyet Daily News, December 7th 2012. Available at: http://www.hurriyetdailynews.com/south-stream-not-a-rival-to-tanap-or-nabucco-energy-minister-says.aspx?pageID=238&nid=36336 [Accessed 20th April 2013]. Noël, Pierre, 2008. Challenging the myths of energy security. Financial Times, January 2008. Available at: http://www.ft.com/cms/s/40c2f8aa-bf93-11dc-8052-0000779fd2ac,Authorised=false.html?_i_location=http%3A%2F%2Fwww.ft.com%2Fcms%2Fs%2F0%2F40c2f8aa-bf93-11dc-8052-0000779fd2ac.html&_i_referer=#axzz2PasBZJS0 [Accessed 10 March 2013]. Piebalgs, Andirs, 2006. 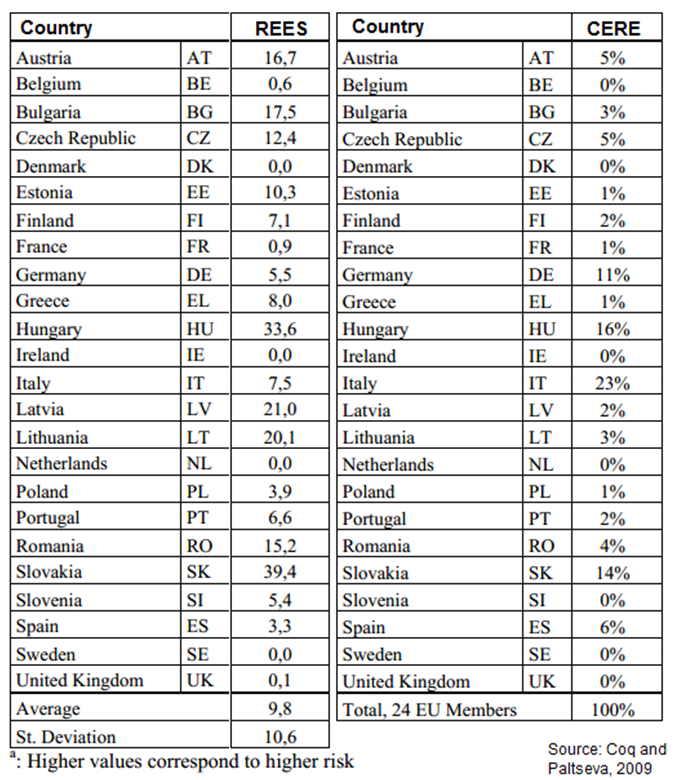 External projection of the EU internal energy market. Brussels: Commission (SPEECH/06/712). Paasivirta, Esa, 1998. The European Union and the Energy Sector: The Case of the Energy Charter Treaty, In Martti Koskenniemi, ed., International Law Aspects of the European Union. The Hague: Brill Academic Pub, p. 197. Padgett, Stephen (2009). External European Union Governance in Energy. Swindon: ESRC. Prange-Gstöhl, Heiko, 2009. Enlarging the EU’s internal energy market: Why would third countries accept EU rule export? Energy Policy, 37(12) pp. 5296-5303. Ratner, Michael et al, 2013. Europe’s Energy Security: Options and Challenges to Natural Gas Supply Diversification. Washington DC: Congressional Research Service. Reuters, 2012b. Europe’s LNG supplies to drop 70pct by 2014 – Barclays [Online]. Reuters, August 9th, 2012. Available from: http://in.reuters.com/article/2012/08/09/energy-lng-idINL6E8J9CA820120809 [Accessed 24th March 2013]. Reuters, 2012b. Lithuania terminal calls LNG supply tender [Online]. Reuters, October 23rd, 2012. Available from: http://uk.reuters.com/article/2012/10/23/lithuania-lng-idUKL5E8LN2Y820121023 [Accessed 24th April 2013]. Riley, Alan, 2012. Commission v. Gazprom: The antitrust clash of the decade? CEPS, Policy Brief, 285 (31 October 2012). Roth, Mathias, 2009. Bilateral Dispute between EU Member States and Russia. CEPS: Working Document, 319 (August 2009). Schröders, G., 2001. Deutsche Russland-Politik, Europa¨ische Ostpolitik, Die Zeit, 5. April. Available from: http://www.zeit.de/2001/15/Deutsche_Russlandpolitik_-_europaeische_Ostpolitik [Accessed 23 March 2013]. Smith, Keith, 2008. 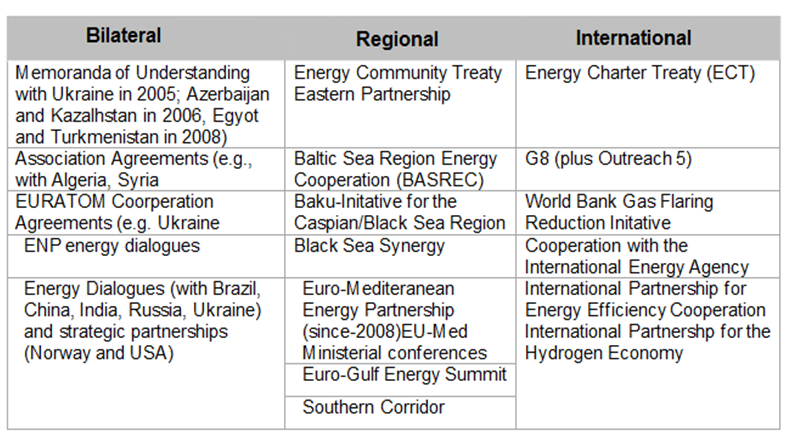 Russia and European Energy Security: Divide and Dominate. Washington: Centre for Strategic & International Studies (October 2008). Sovacool, Benjamin K., 2011.The Routledge Handbook of Energy Security. London; New York: Routledge. Timmermann, H., 2007. Die Deutsch-Russischen Beziehungen im europäischen Kontext. Internationale Politik und Gesellschaft, 1(2007), p. 101–122. Timmins, G., 2011. German-Russian Bilateral Relations and EU Policy on Russia: Between Normalisation and the Multilateral Reflex. Journal of Contemporary European Studies, 19(2), p. 189-199. Vahl, Marius, 2006. A privileged partnership? EU-Russian relations in a comparative perspective, Danish Institute for International Studies Working Papers, 2006/03. Vos, Sebastian. 2006. Europe’s infant energy strategy looks muddled and unclear, Europe’s World, 4(2006), pp. 133-137. Yergin, Daniel, 2006. Ensuring Energy Security. Foreign Affairs, March/April 2006. Youngs, Richard, 2011. Energy Security: Europe’s New Foreign Policy Challenge. London; New York: Routledge.